Kirstin Barclay leads a trifecta for her stable when driving Paddy Proudfoot to win at Winton. Photo: Wild Range Photography. The good times continued to roll for trainers Kirstin Barclay and Paul Ellis at Winton on Saturday when they scored their first race trifecta. Barclay led her stable’s success by steering Paddy Proudfoot to win over his stablemates, Franco Hampton and Chuckles. The Barclay-Ellis trifecta came during a magical month for the trainers. 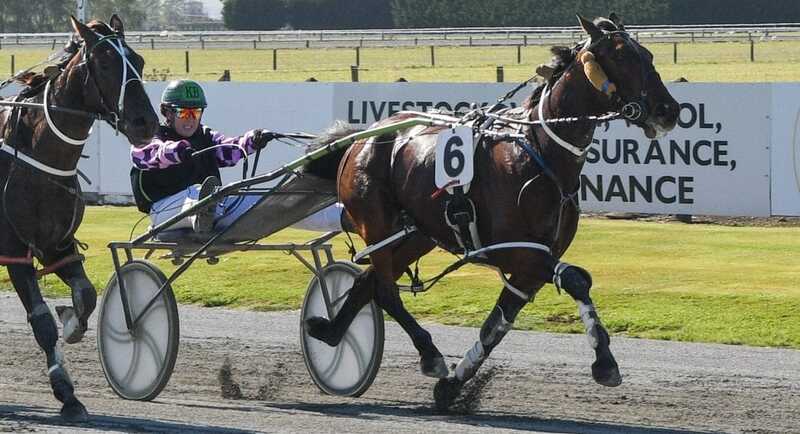 The pair have caught the attention of harness racing fans across New Zealand through the deeds of their break-out performer, U May Cullect. “It has been a bit of a fairytale, really,” Barclay said. Though he has not shown quite the same zip as his stablemate, there are some parallels between U May Cullect and Paddy Proudfoot. And the Winton winner has a decent share of his own ability. Barclay and Ellis have had to be patient with both pacers, who have gone amiss in their two previous preparations. “Paddy ran a really good second in his first start at three, but I had to scratch him on the morning of his second start,” Barclay said. Paddy Proudfoot’s second racing preparation was also cut short after just one start. Barclay credited the Duffy family, who race the Washington VC four-year-old, for having a patient approach and giving Paddy Proudfoot every chance to get over his injuries. They were rewarded for that patience when their pacer held out the finish of his stablemate, Hampton, to score by a neck. Hampton showed he was getting close to a maiden win when pushing Paddy Proudfoot in the final 100m. Like Paddy Proudfoot, the third-placed, Chuckles, has faced health battles away from the racetrack. The three-year-old put two wind operations behind him when he produced a big finish for third in his debut on Saturday. The Barclay and Ellis stable star, U May Cullect, has recovered well from his brilliant win at Addington on Easter Cup night. The stable’s plan means good news for southern harness fans, but not so good news for Addington officials. U May Cullect was likely to have two more starts in Southland this season before being spelled, Barclay said. His trainers are set to resist the temptation to race the Gotta Go Cullect pacer at Addington again this season. The break-out pacer is almost certain to return there in the spring for New Zealand Cup week.